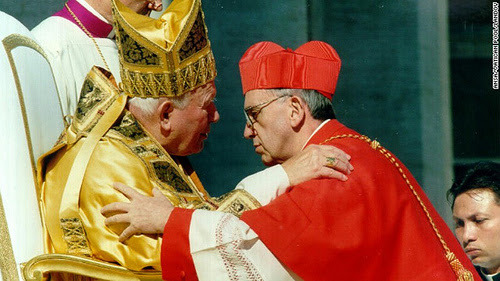 In his service to the People of God, Saint John Paul II was the pope of the family. He himself once said that he wanted to be remembered as the pope of the family. I am particularly happy to point this out as we are in the process of journeying with families toward the Synod on the family. It is surely a journey that, from his place in heaven, he guides and sustains. The Synod on the family, of course, concludes this week. Sadly, based on reports coming out of Rome, it would appear that most of the cardinals and bishops gathered for the Synod are unaware of the treasure that “the pope of the family” gave us in his theology of the body. I’ve read of interventions at the Synod calling for compelling answers to the pressing questions on the hearts and minds of contemporary men and women regarding marriage, but I haven’t heard of any reports recognizing, as John Paul II affirmed, that his theology of the body provides “the answers to the perennial questions in the conscience of men and women and also to the difficult questions of our contemporary world concerning marriage” (TOB 133:4). I’ve read of interventions at the Synod calling for a renewed appreciation of magisterial teaching on sexuality and marriage, but I haven’t heard of any reports recognizing, as John Paul II affirmed, that “the theology of the body … is quite indispensable for an adequate understanding of the magisterial teaching” on these subjects (TOB 59:7). Similarly, I’ve read of numerous interventions calling for renewed educational efforts that help contemporary men and women understand the requirements of marital love, the reasons for these requirements, and for pastoral solutions that empower men and women to fulfill those requirements, but I haven’t heard of any reports recognizing, as John Paul II affirmed, that his theology of the body “is at the same time a pedagogy [that] seeks to educate man by setting the requirements before him, giving reasons for them, and indicating the ways that lead to their fulfillment” (TOB 59:2). I also read an intervention at the Synod insisting – rightly – that what is needed to address today’s crisis in the family is an extensive, Christ-centered, biblical vision that restores the foundations of what it means that we are created male and female in the image of God, but this bishop seemed completely unaware of the fact that we’ve already been given precisely this in Saint John Paul II’s theology of the body. It can be disheartening, but, honestly, it’s not surprising. This has been my experience speaking to priests and bishops around the world over the last two decades: very few are familiar with the riches Saint John Paul II has given us. I say this not to disparage the leaders of our Church. There are a-thousand-and-one understandable reasons they haven’t been exposed to John Paul II’s teaching. I say it, rather, to give those of us who have been exposed to this life changing teaching a-thousand-and-one reasons to share it with everyone we know – including our priests and bishops! You are completely correct. I have not heard a word about TOB. And it is precisely the answer to the doctrine/love disjunction. As I think it out, TOB is couched in the personalist anthropology of "I" - "thou." Francis is speaking in the context of the sociological and cultural; i.e., Marxist liberation theology which was opposed by the Christian liberation theology of pueblo fiel. In my reading of "The Reformer Pope" by Austen Ivereigh. Bergoglio, as Jesuit provincial of the Argentine Jesuits, was squeezed in this position between younger Jesuits whose primary concern was overcoming devastating poverty by their personal involvement with the poor, and Jesuits of Pueblo fiel, who were spiritually sound and doctrinally faithful. All of liberation theology has to do with the liberation of the person from sin and its effects. I believe a perfect example of pueblo fiel was the "reductions" of Paraguay (by the falls of Iguazu) that were the mission territory of the Jesuits of the17th c. You have seen the movie "Mission" which is indescribably fabulous. But when all is said and done, it is a religious and clerical phenomenon of religious as missionaries entering into a secularized sinful setting. What would it be if it were layman dealing with layman, and not priest...? (I am thinking out loud) TOB is concerned about the truth of the human person, husband and wife, as self-gift and forming an unum as image of the Trinity that is unum. This occurs to me thinking out your acute observation on the non-appearance of TOB. Should it appear? The dynamic of love and truth as identical in the human person is the dynamic that would explain both poles of the disagreements. It is always GS #24: Man... becomes himself by the sincere gift of himself. the truth of man is love. This is why I think that the cultural failure to enter matrimony as self-gift disqualifies it as valid sacrament - which means that the majority of couples are not married, and that the question as to whether the divorced-remarried can receive Communion is a gift to us to confront this widespread invalidity, and to transform the entire understanding of evangelization of and in the Church. It is a bomb that must be detonated. VIVA TOB!!!! Where TOB is not understood and lived, there is no matrimony.